I've seen this graphic many times in presentations, and I wanted more background on it. The original article is here. With the details behind Christian's calculations. 3-yr Energy Use Cost = 3 yrs x (8760 hrs/yr) x ($0.10/kWhr) x (Server Power in kW) x PUE (1) where PUE is the Power Usage Effectiveness  or the Data Center Electrical Load over the IT Electrical Load. For a well managed data center this value is usually about 2.0 (or less), which implies that for every Watt of server power, an additional Watt is consumed by the chillers, UPSs, air handlers, pumps, etc. Indications are that for some data centers this value can be as high as 3.0  and in some cases higher. Usually, this variation is completely due to how well the cooling environment is designed in the data center and has a direct relationship to the energy cost . Using equation (1) for a 1U server (which, when fully configured, costs about $4,000 and consumes about 500 W) and a PUE of 2.0 results in a cost of energy of $2,628. This is almost as much as the server itself, but the reality is that in many cases the cost is much higher. In Japan, energy costs are twice as much, so this number would be double. To make matters worse, in data centers where the cooling design is poor (PUE = 3.0, for example), the cost of energy would be 50% higher. This means that the energy cost would be $3,942 in the U.S. and $7,884 in Japan. Clearly, there can be huge savings in this energy cost by focusing on optimizing the cooling in the data center as shown in the articles identified earlier [3,5]. While, admittedly, the authors state that there is a large error band around this equation, it is very useful in capturing the magnitude of infrastructure cost. In fact, it is this author’s contention that this equation could be fine tuned for more accuracy using PUE because poor cooling will mean that more infrastructure will be needed. However, that discussion is beyond the scope of this paper. 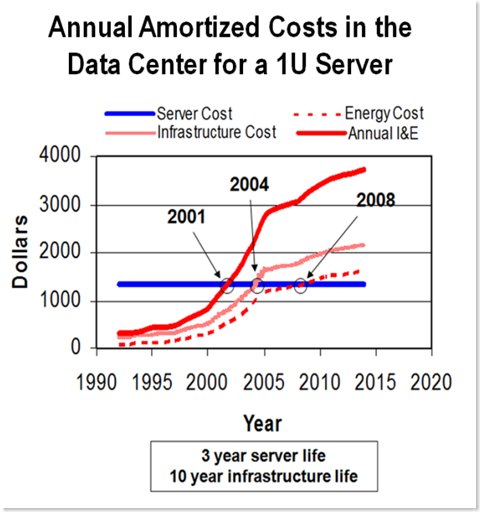 Again, looking at the 500 watts of power consumed by the 1U server and using equation (2) and ignoring the IT space the server occupies, the cost of infrastructure to support that server would be enormous at $11,000. The reality is that this cost would be amortized over 10 to 15 years so real annual cost of the infrastructure is $1,100 per year. For the 3-year life of the server, this equates to $3,300 or again close to the cost of the server. Note that there is also an adjustment in the cost as a result of the space occupied by the server, but its calculation is beyond the scope of this discussion.